IRS Form 7004, officially known as the “Form 7004 – Application for Automatic Extension of Time To File Certain Business Income Tax, Information, and Other Returns,” is a request for an automatic extension of time to file certain business tax returns. The deadline to file a Business Tax Extension is March 15, 2014. An IRS Form 7004 can be submitted to automatically extend the filing deadline for 32 different IRS returns. The IRS typically grants automatic extensions of five (5) or six (6) months, depending on the return for which the extension is filed. Please note: IRS Form 7004 does not extend the time for payment of tax. Generally, payment of any balance due according to IRS Form 7004 is required by the due date of the return for which this extension is filed. 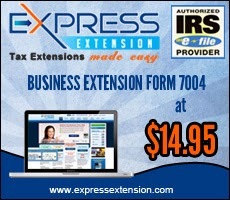 Do not let the deadline sneak up on you, file your extension today!